Ramallo is a town of 11.000 inhabitants, located just 16 km south of San Nicolás in an area of intense agricultural production. The largest hardboard (made with eucalyptus) factory in the country is here. The NCA Railway serves the town, which is 10 km away from the Rosario-Buenos Aires highway (Highway Nº9). Highway N061 connects Ramallo with the farming region in the north and west of the province of Buenos Aires. Port installations consist of a grain elevator of the early type and two obsolete general cargo wharfs. The elevator loading berth has a central platform of 20 m With 2 additional berthing dolphins giving an overall berthing front of 57 m with outlying buoys to take bow and stern moorings. The berth is connected to the elevator by a long viaduct fitted with 2 horizontal conveyor belts which carry the grain to a loading tower which is fitted with 2 loading chutes. The chutes have a maximum clearance above the quay of 18m and can rotate horizontally through 1800 on a radius of 20 m. Vessels are, of course, obliged to shift up and down the berth if loading involves end hatches. 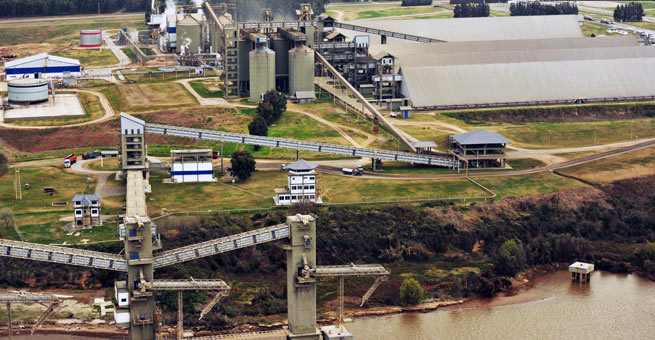 The elevator is operated by Puerto Ramallo S.A., has a storage capacity of 18.000 ton and a load rate of about 500 TPH. One of the general cargo wharfs is very occasionally used for discharging bagged fertilizers.